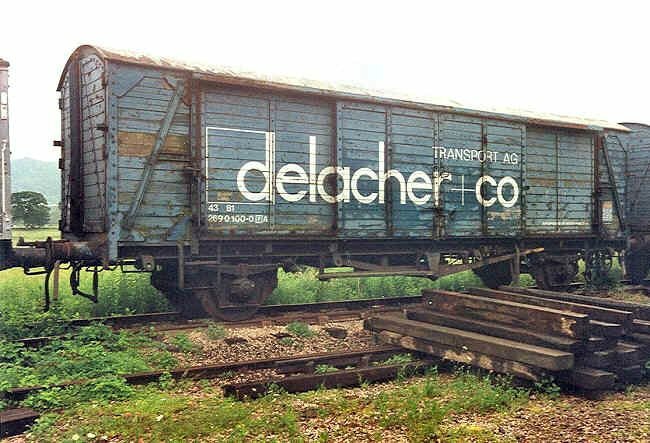 This twin van was originally built as two separate German State Railways (DRG) ferry wagons. Sixteen of these were modified by OBB at Linz between 1956 and 1960 and were numbered from 21 81 214 1 000 up to 21 81 214 1 015. The relevant OBB diagram number was A 521-1209 and the wagon type was Hcfs. 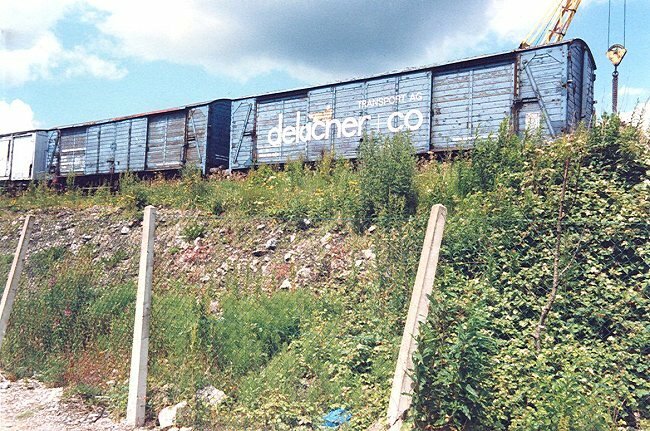 Photograph taken 2nd July 1990. 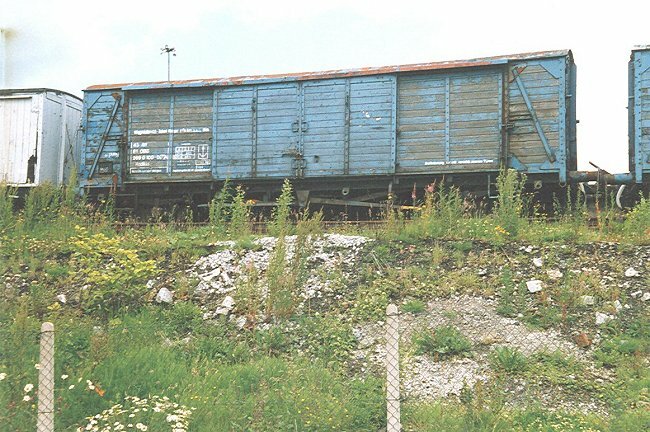 Conversion of two wagons to a permanently-coupled twin van was undertaken in OBB's Linz workshops in 1980 and it entered service as a privately owned wagon on 21st October of that year. Wagon 21 81 214 1 000-3 had a vacuum through pipe before conversion to 43 81 269 0 100-0 A. Wagon 21 81 214 1 008-6 had a vacuum brake before conversion to 43 81 269 0 100-0 B. 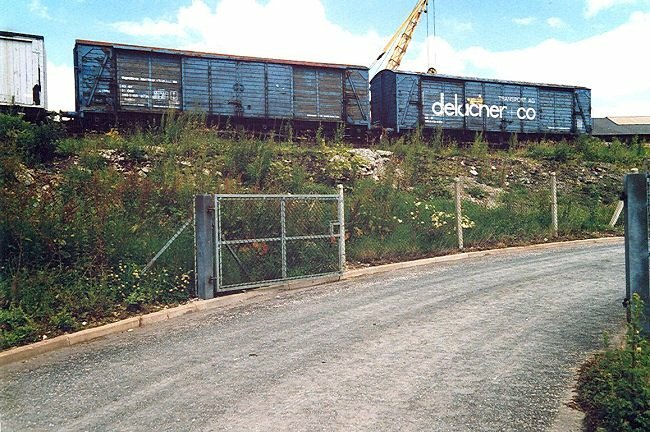 Photograph taken 12th June 1993. The twin wagon was owned by wagon leasing company Robert Metzger & Co Waggonleihanstalt, Opernring 7, 1010 Wien. 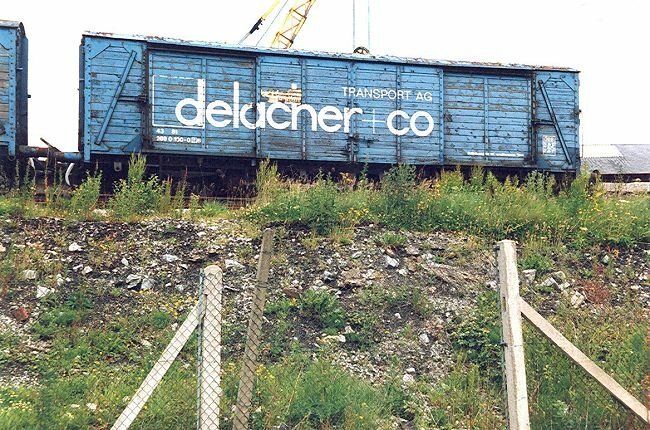 It was operated by Delacher & Co Transport AG, Kapfweg 20, 6801 Faldkirchen-Tosters. Photograph dated 2nd July 1990. 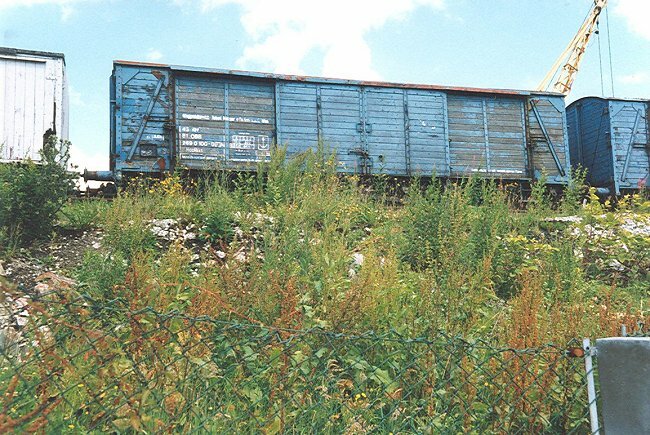 This is wagon number 43 81 269 0 100-0 A . 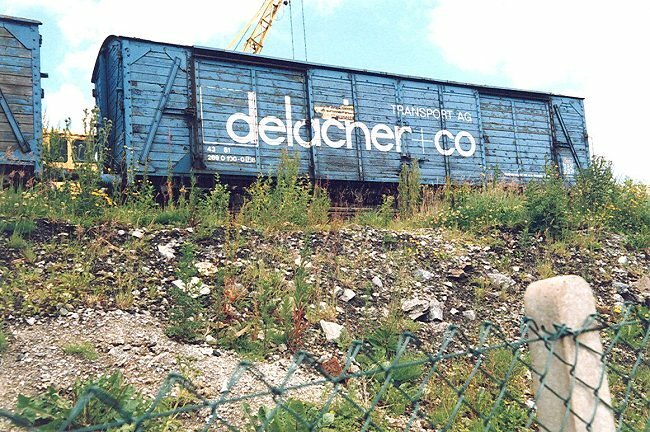 Each of the two permanently coupled vans is painted this way on one side and has "Delacher + Co" on the other side. Photograph dated 2nd July 1990. 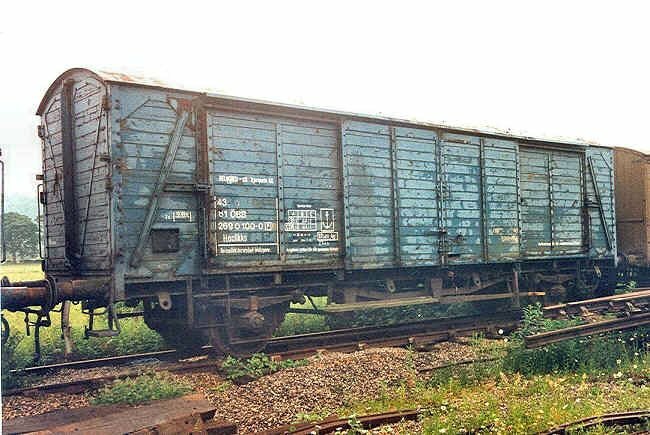 This is wagon number 43 81 269 0 100-0 B . 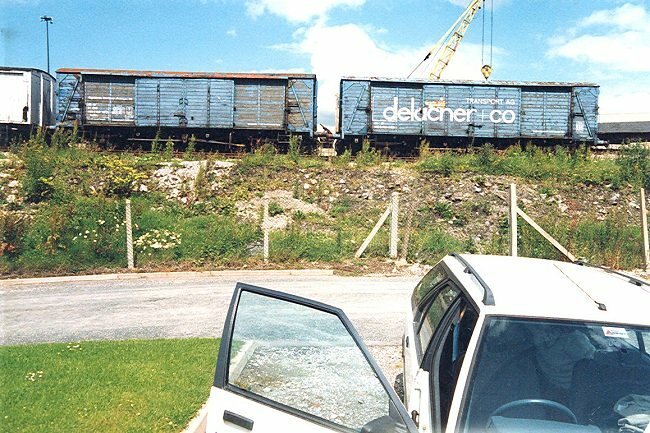 Photograph taken 12th June 1993. The twin wagon was registered to be able to travel on BDZ, BR, CFL, CFR, CFS, CSD, DR, DSB, FS, GySEV, JZ, MAV, NS, NSB, OBB, RAI, SBB, SJ and SNCF. Oddly there seems to be no mention of her being registered to operate in either Belgium or Poland. When converted to a twin van this vehicle was designated type Hackfikks. Photograph dated 2nd July 1990. Only one pair of DRG ferry vans were modified to form a twin wagon set, making this a unique preserved vehicle. Photograph dated 2nd July 1990. Twin wagon by the entrance to the preservation site at Buxton. Photograph dated 2nd July 1990. A final look at one part of the twin wagon set. Photograph dated 2nd July 1990.